We drive by the “Be Work Zone Alert” billboards all the time, reminding us to slow down and drive safe through road construction zones, with compassion-provoking reminders like, “Be alert, our mom’s at work.” And indeed, rather than feel annoyed at the roadwork construction that delays our driving progress, let’s continue to be mindful of the real risks that the workers face every day on the job. Training: All workers should be trained in how to work next to traffic in a way that minimizes their vulnerability, including being trained on traffic control techniques and device usage and placement. 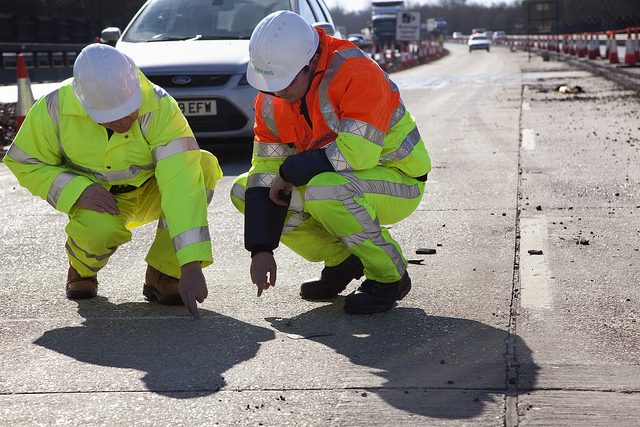 Worker Clothing: Workers exposed to traffic should wear bright, highly visible clothing similar to that of flaggers. Barriers: Barriers should be placed along the work space depending on clearance of workers from traffic, speed of traffic, volume of traffic, time of day, and duration of operation. Speed Reduction: In highly vulnerable situations, consideration should be given to reducing the speed of traffic via speed zoning, funneling, use of police, lane reduction, or flaggers. Use of Police: Stationing police units heightens the awareness of passing traffic and will likely cause a reduction in travel speed. Lighting: For nighttime work, lighting the work area and approach laneways help drivers comprehend the requirements being imposed. Special Devices: For difficult work area situations it may be helpful to include rumble strips, changeable message signs, hazard identification beacons, flags, and warning lights. Public Information: Improved driver performance may be realized through a well-prepared public relations effort that covers the nature of the work, time and duration of its execution, the anticipated effects on traffic, and possible alternate routes and/or modes of travel. Road Closure: If alternate routes are available to handle detoured traffic, the road may be closed temporarily during times of greatest worker hazard, which, in addition to offering maximum worker safety, may facilitate quicker project completion and thus further reduce worker vulnerability. For more information visit the MUTCD webpage.